"The spiny mice should be as large in size as possible. The body is robust and firm, roundish in shape, without being fat. 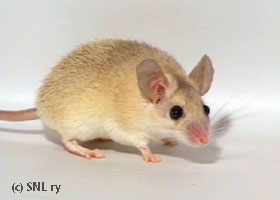 The differences between male and female spiny mice should be clearly defined. note the not yet developed colour on the young ones. The head is wide and tapers to a fine nose; not too sharp or disproportionally long. The head should not dominate the overall image of the spiny mouse. The eyes are large, bright and round. Ears are located relatively high and point upwards, but there should not be too narrow a distance between the ears. The whiskers are long and bushy. The coat is soft and smooth. The spines, which are located on the back portion of the body, should be short and stocky. 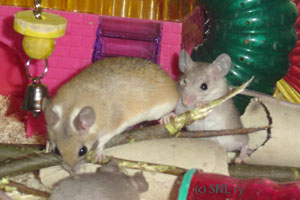 The fur on top of the spiny mouse is covered with long, transparent overhairs. The judge should take into consideration that the coat of a young spiny mouse, especially the spine, aren't yet fully developed. The tail should be equal in length to the body, straight, round and covered with fine scales. Common faults: The spiny mouse is too fat (common on older animals) and the differences between males and females being unclear." The basic colour shall be warm brownish red with dark and even tipping. The undercolour to be almost white, the tips of the hairs black or brown on the back and head. On the forehead there should be a diamond shaped bonnet formed by dark tipping. Belly as white as possible. The demarcation line between the top and belly colours should be straight and clear. There shall be clearly defined white areas under the eyes and around the ears. Feet white, nails and whiskers neutral. Eye black. 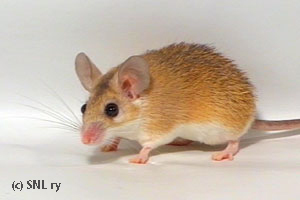 The judge is to take into consideration that the colouring of a young spiny mouse is not as yet fully developed. Common faults: Too light pigment on skin. The basic colour not warm enough reddish brown. Unclear bonnet. Agouti's biggest problem is the redness of colour. That is, there isn't any. Now, where will you get it? Even though it seems easy to breed agoutis, but it certainly isn't. You should pick only the mice with relatively red and even colour at the age of a year for further breeding. Spiny mice develop slowly, so you shouldn't breed them too early as you can't yet say what the quality of the parents will be! Another problem with agouti is the tipping, which is either too plentiful or located in clumps. Tipping should be even! Here it should be noted that basic colour is more important than tipping. If you are presented with a warm red spiny mouse with horrible tipping and a yellow light one with even tipping, choose the first mouse. You can breed the tipping out later on, but the redness is the first problem. ?The basic colour should be rich cream with darker tipping, which should be as even as possible. The undercolour almost white. Belly white. The demarcation line between the top and belly colours to be clear cut and straight. There shall be clearly defined white areas under the eyes and around the ears. Feet white, nails and whiskers neutral. Eye black. Common faults: Tipping too dark and too heavy, bonnet. Unclear demarcation line." Creams are pretty much inbred, so first of all you should choose animals who are as little related as possible. For a while, crossing with agoutis is recommended. This way there will be more cream carriers. However, agouti does not do any good for the colour of cream. Cream is not a tipped colour like agouti, so with an agouti cross you will get tipping and plenty of it! Another problem along with the tipping is greyness of colour. Cream should be clearly creamy and have a clear demarcation line between the top and the white belly. "The markings on head large and situated in the middle of forehead. It shall be as symmetric as possible, round and white. Body color to meet the standard laid down for it. Common faults: The colour does not fully correspond a standardized colour variety." With White Spots you can't usually even talk about good animals. If you see a spiny mouse with a spot, it is a good spotted no matter what quality it is otherwise! It feels like this marking is directly connected with everything negative. The basic colour of a spotted spiny mouse is relatively light with dark tipping, the heard is long and with Roman arch, the body long and slender. There is (or, isn't) a beautiful white spot on the forehead, depending on the moment? Sometimes the spot looks fine, at other times you have to search for it with a magnifying glass. This is a difficult variety, especially as it is recessive. So, you should try not to cross them with non-spotted spiny mice? Text: Finnish Show and Pet Mice club's standards + Lotta Ahlfors & Kaisa Kattilakoski.